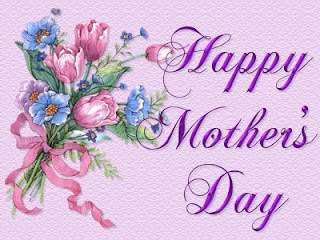 To all of you out there who are mothers we wish you a wonderful day today. May you be greeted with hugs and kisses and maybe even breakfast in bed. May today be about YOU, with you getting to make the plans for the day. and if for some reason you don't, remember they still do love you no matter what. May something today put a smile on your face - at least twice. brother Richard, and his family in San Antonio. She has always been a fighter, and always taught us right from wrong. Her love for her three children is boundless. but to also show the soft side, that you can be tough, but loving. what about us future mamas!? just joshing sweetness! Thanks Mama for bringing such a wonderful baby boy to this world! Your dad is the one on my left, correct? Cheers to all the mothers. Vinny--I guess you will get the bonus points for today with that posting! I am sure you will put a smile on Mom's face. You brought tears to my eyes so early in the morning. I wish we could all be together. It has been too long. Mom--Happy Mother's Day. Sorry Vinny and I couldn't be with you but we are glad you are with Cindy, Richard, Amelia, and Adele. I love you! Have a great day! TISHA: Are you trying to tell us something Belle? MATT-MAN: You are a true genius.. did Schoomp help you figure that one out? Beautiful tribute, Vinny. Great music, wonderful words, touching photo. I shouldn't have listened to the music; now I can't stop crying. I envy you, you know that? Have a great rest of the weekend. Looking forward to your next Monday Matinee. First off, Happy Mother's Day to the lovely and wonderful Mamma Joan. "A mother is not a person to lean on, but a person to make leaning unnecessary." - Dorothy Canfield Fisher. You've done a wonderful job and raised loving children. All a mother can hope for. Thank you for the kind thoughts. Breakfast in bed is a wonderful thing.. especially when the mystery fruit is a grape! LOL! vinnie, you get extra points from me! nice post honey, and thanks. now is there any cake in here? Happy Mama's day to all the mother's out there!!!!!!!! The shot of your parents is gorgeous. What a handsome couple they make.